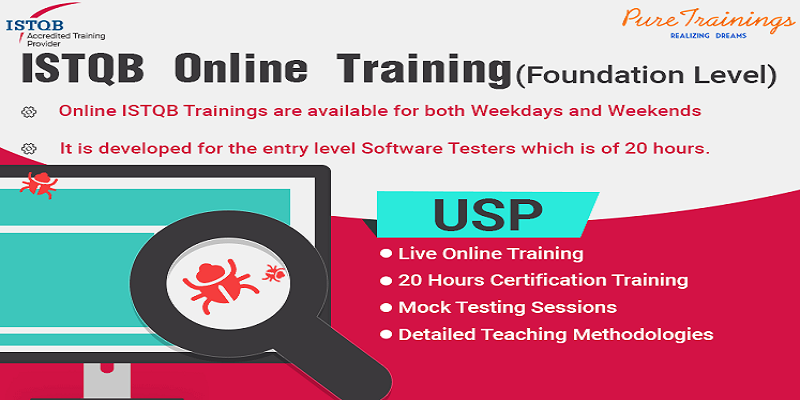 Are you looking for a globally recognized certification in software testing? ISTQB is acknowledged to be the only worldwide accepted certification for software testing, accredited through its network of national boards. International Software Testing Qualifications Board (ISTQB) is a trusted software testing qualification certification organization that operates globally. As an accredited ISTQB training provider, ‘PureTrainings’ is offering ISTQB Foundation Level Online Training to the candidates. This 20 hours instructor led training ensures systematic coverage of ISTQB syllabus and helps in getting prepared for the Foundation Level Examination. ISTQB Foundation Level Exam is a test for knowledge, not skill. It tests information about the candidate’s familiarity with the most common concepts of software testing and associated terminology. The Foundation Level Exam does not require work experience. This exam is basically a stepping stone towards the Advanced Level that is more in-depth and practice-oriented. At our institute, the ISTQB Foundation Level Training has proved to be an integral part of certification success for many candidates. The content, quality as well as syllabus coverage of training materials is checked by our experts before providing training to the candidates. Why our Online ISTQB Foundation Level Training? At ‘PureTrainings’, the candidates will learn all basic skills required for software testing and how it fits into software development. The ISTQB Foundation Level Exam is the baseline of information for a software tester and is a prerequisite for the Advanced Level Certifications.